Since breaking ground in the summer of 2016, Encore Boston Harbor has transformed the physical landscape of Everett and has impacted the economic and social landscape of the city of Boston and beyond. 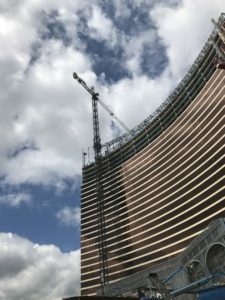 Daniel Marr & Son Company is nearing completion on the final steel work that encompassed four significant steel phases with Suffolk Construction at the Encore Boston Harbor: the 260,000-square-foot Central Utility Plant; the 725,000-square-foot hotel and gaming area known as the Podium; the 250,000-square-foot Convention Center and an elaborate hotel roof structure of grating platforms and screen walls. At peak manpower, 150 iron workers were on the project accumulating 177,000 man hours over a period of a year and a half. Seven tower cranes were utilized to erect the steel and a 300-ton crawler was also used at the Convention Center. Marr Scaffolding Company provided access equipment for the installation of the glass facade and Encore signage on the exterior sheer walls of the three million-square-foot structure. The work at Encore represents one of the most complicated swing stage projects in the company’s history due to a demanding schedule, weather conditions and location. Working for glass manufacturer Ferguson-Neudorf, Marr erected five swing stages totaling 185 feet for the installation of windows on the two exterior sheer walls of Encore’s 350-foot-tall curved glass tower. As the tower’s concrete sheer walls were poured, swing stages were needed to access the exterior façade to place the glass panels. Accordingly, Marr installed swing stages starting on the 10th floor, then moving up to the 26th floor, and finishing on the roof for the installation of 4,900 panels weighing between 700 and 1800 lbs. each. Electric sign company YESCO contracted with Marr to erect eight swing stages for the installation of “Encore” signs on the north and south-facing walls. 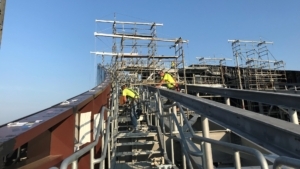 To accomplish this, Marr installed 136-feet of swing staging on the northwest wall and 150 feet of swing staging on the southwest wall, along with building system scaffold towers reaching 80 feet in some locations to support the rigging beams for the platforms. One of the key challenges was installing swing staging on the southwest wall around an existing tower crane, which required a custom design allowing it to fit between the crane’s two support beams. Daniel Marr & Son designed, fabricated and installed 150 feet of I-Beam Monorail in the four different swing stage locations to facilitate positioning the windows. Marr Scaffolding provided 45, 12-foot to 40-foot scissor lifts and 12, 80-foot to 135-foot boom lifts to Daniel Marr for steel work. 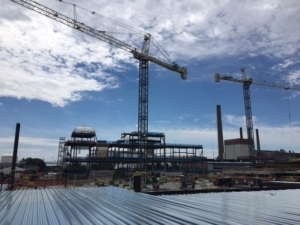 Marr Crane & Rigging provided a variety of cranes including several 90-ton cranes and a 300-ton Leibherr crane throughout the construction process.